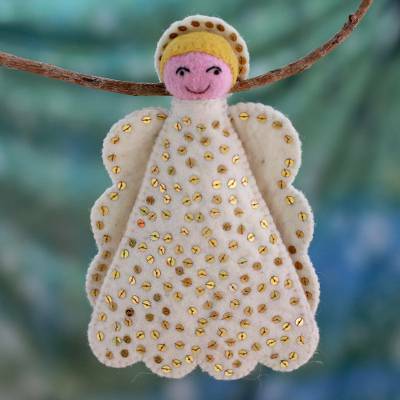 Handmade Angel Treetop Ornament, "Angel Smile"
Sequins sparkle on the pristine white gown of a smiling angel. Rajesh Gehlot crafts the celestial messenger by hand to sing the good news atop a Christmas tree. Bought her to decorate at Christmas however I love her so much and she is so pretty that I have her displayed in my bedroom now. We all can use guardian angels.